Get customized Food and Beverage Industry Email List, F&B Mailing List, and F&B Telemarketing list to reach Food and Beverage Industry Executives and Decision Makers in the US, the UK, Canada, Australia, Middle East, South Africa and Asia. As per Lucintel, “the global food and beverage retail industry is expected to grow at a CAGR of 5% over the next five years.” The growth looks promising for F&B equipment manufacturers, products/solutions and service providers who support the industry directly or indirectly. To help such marketers implement their marketing campaigns proficiently, Blue Mail Media offers Food and Beverage Industry Executives Email List that gives you access to complete marketing information to reach out to your target audience via telephone, email or mail. Our Food and Beverage Industry Email Database has been prepared by keeping in mind the strategic needs of marketers. We collect data from authentic sources, verify data, check for discrepancies, and constantly enhance the quality of data. Reasoned to the same, our clients achieve seamless interactions with their prospects and drive significant conversions. Since each business organization has different requirements, we offer to our clients customized Food and Beverage Industry Mailing List that aligns well with their campaign specific needs. Our team of data scientists, experts and analysts continuously engage themselves in data verification and enhancement process, so that its accuracy can be maintained for the clients to take the maximum advantage of. 1. How reliable is your Food and Beverage Industry Email List? Our Food and Beverage Industry Email List provide 85-90% of accuracy and up to 90% of deliverability rate. Our team of data scientists makes more than 1 million verification calls and sends more than 8 million verification email to keep the list updated and afresh. 2. Does your Food and Beverage Industry List offer any customization option? Yes. We provide Food and Beverage Industry List in both prepackaged and customized format. Based on your business needs, you can easily segment the data. That is, you can segment the list using various factors such as SIC code, NAICS code, geographical location, company’s revenue and many more. 3. Can I target the global industries using your Food and Beverage Industry Mailing List? Yes. You can easily reach top-notch decision makers and executives across various regions using our Food and Beverage Industry Email List. It includes- the US, the UK, North America, Canada, Europe, Australia, Middle East, South Africa, Asia, and other. 4. Is your data source for your Food and Beverage Industry Email List is authentic and trustworthy? Yes. You can trust the data provided in our Food and Beverage Industry List. Our team of experts collects the data from highly authentic and internationally trusted sources. That is, our data sources include surveys, government records, trade shows, yellow pages, business directories, conferences, meetings, and many more. 5. 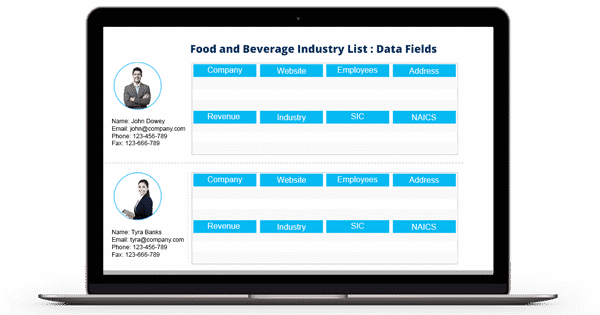 What is the various information you provide in your Food and Beverage Industry Email Database? Our Food and Beverage Industry Email List delivers all the necessary marketing information in it. It includes- first name, last name, company, location, web address, phone number, job title, revenue, company size, SIC code, NAICS code, and more. 6. Does your Food and Beverage Industry List comply with GDPR and Anti-Spam law? Yes. We built our Food and Beverage Industry Email List to stay compliant with the guidelines of GDPR and Anti-Spam law. 7. In which format will you provide my Food and Beverage Industry Mailing List? Once you make the payment, we will email you the Food and Beverage Industry List in Microsoft Excel format.